I absolutely adore chocolate and cinnamon together so I tweaked a chocolate pudding recipe to mimic the flavor profile of Mexican hot chocolate. Want some? You know you do. Sorry I can't share, but you can make your own. Just measure out the ingredients and grab a heavy-bottomed saucepan, a whisk, and some dessert bowls - I'll help you along the way. You won't believe how fast and easy the process is. Strain the pudding through a sieve to remove any lumps. Quickly pour the pudding into dessert dishes and press plastic wrap directly on the pudding surface to prevent a skin from forming... unless that's your thing ;). Chill for a couple hours before serving. I like to garnish with freshly whipped cream and ginger snaps. In a heavy-bottomed sauce pan over medium heat, combine the cornstarch, sugar, cinnamon, and salt; add the milk and cook, whisking constantly, until the mixture thickens; about 15-20 minutes (I like to get in there with a flat silicone spatula every now and then to be sure nothing is sticking in the corners or on the bottom of the pan). Remove pan from heat and stir in chopped chocolate and vanilla; stir until chocolate is melted and fully incorporated. Strain through a sieve before spooning into individual ramekins to ensure a perfectly smooth texture. Cover pudding with plastic wrap that is touching the surface of the pudding to prevent a skin from forming. Chill for a couple hours. Optional garnish - freshly whipped cream and ginger snaps. Most people are familiar with mangoes, but do you know about yellow mangoes (bottom left in the photo above)? You might also see them called Manila, champagne, young, baby, honey, Ataulfo, or Adolfo mangoes. 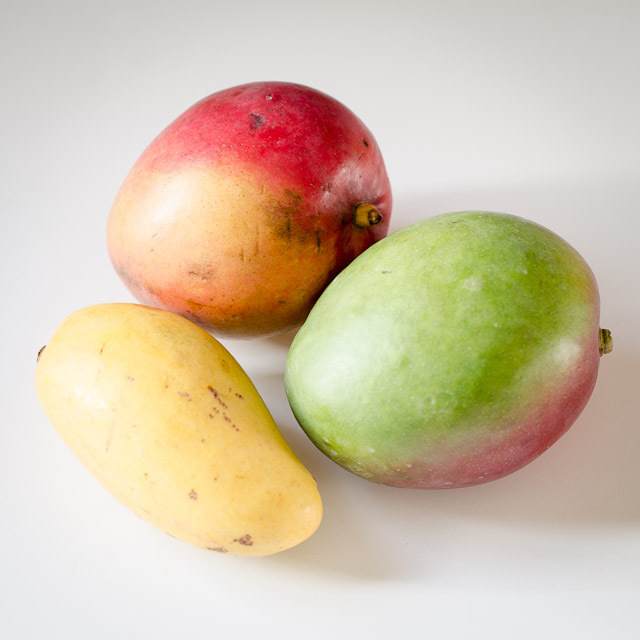 In the photo above, you can see the yellow mango is shaped differently than more common varieties. I prefer yellow mangoes for their delicately sweet flavor and "stringless" texture. Another great feature - they have one of the thinnest seeds among all mango varieties so you get more mango for your money. These tasty fruits cost about $1 and are in season from March through September. This mousse can be made up to 24 hours in advance and requires no cooking so it's a cinch to put together. I hope you'll give it a try. In a food processor or blender, puree mangoes until smooth; pour into a medium mixing bowl. Carefully fold in whipped heavy cream; repeat with whipped egg whites. Divide mousse evenly among 6 dessert dishes and chill.